A lot of people have asked me recently what I've been up to. And while it's not a journey of miles (for the most part), it is a journey of life. And I don't mind sharing a bit. I recently traveled to Jasper, to collect some information for an upcoming travelogue for Let's Go magazine and a review of the Boardwalk Cafe for a future Tie Dye Travels article. It was absolutely gorgeous up there at the birth of spring... but also a little disturbing down the road a bit, where the trees are stripped and splintered from the ice storm this spring. I also went to the 1st Ever Sixth Annual World's Shortest St. Patrick's Day Parade and Pub Crawl in Hot Springs, where thousands turned out to catch a glimpse of former Cheers star John Ratzenberger and, more importantly, the San Diego Chicken. I was quite delighted by the attitude of these paradegoers, who waited patiently for hours to catch a glimpse of the 98' route's worth of fun. And Elvis gave me a Ding Dong, but I'll explain more about that later. I was also lucky enough to attend Empty Bowls, a big fundraiser for the Arkansas Foodbank Network. Each year, artists create bowls and other artworks which are auctioned off to benefit this worthy cause. It was also a great chance to catch up with some of my former Today's THV co-workers and find out how things are going at the station. And... well, it's been life. I just returned from MidSouthCon, a venerable sci-fi convention that now also hosts a writer's convention as well. I've knocked out a few reviews for the Arkansas Times' Eat Arkansas blog, and picked up more information for Tie Dye Travels. Most of all, I've been spending time with my husband and my daughter Hunter... who has recently learned how to giggle. And she's beginning to teethe -- I guess I can handle that, too. Life is good. The journey continues. 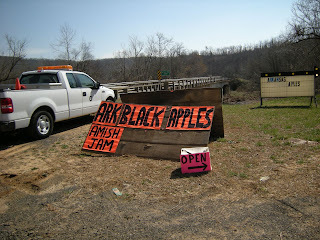 The sign has been passed year after year on Highway 65... the sign that reads "Arkansas Black Apples." For many years, I didn't give it much thought. Of course, those were childhood years and not those of later times. These past cycles of fall to winter to spring, I've passed the sign and started wondering... just what are Arkansas Black Apples? And why am I only seeing them here? On a lazy March morning with traveling companion in tow, I stopped at this roadside space near Leslie. There was much evidence of the recent ice storm -- with trees split around and piles of sawdust here and there where felled timber had crossed the road. But the day was perfect, sunny, and in the sixties. The little nondescript building was quiet when we drove up. A gentleman was out in the yard of the place, but he came up to greet me when I stepped out of the van. We walked inside and I had a look around. 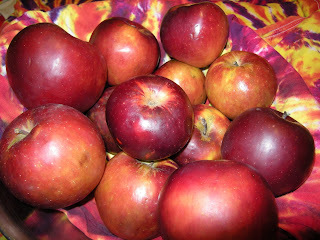 Yes, there were baskets of Arkansas Black Apples here -- dark maroon-colored fruit that shone darkly in their baskets. 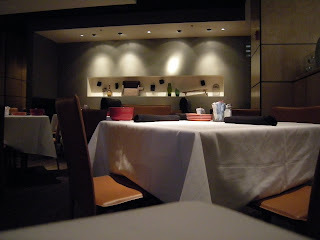 There were also Galas, Fujis, Granny Smiths, and more. I asked about the apples, and was told they came from Alabama. Well, most of the apples. The Arkansas Blacks were grown nearby, just outside of Leslie. Without further ado, I ordered up a basket to take home. Baskets, by the way, are $7 for any type of apple. 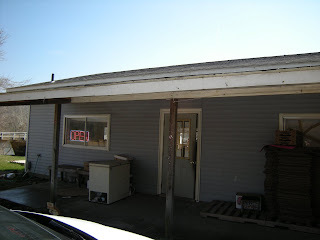 The little shop also had Amish-style jams (from London, TN) and locally dug quartz crystals. 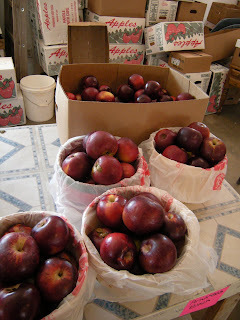 When I got home, I checked out more about Arkansas Black Apples. Turns out, they were once incredibly popular here, a native-grown species that's a variety of the Winesap. It's harvested in the winter months. You can learn a lot more about it here. The apples had fragranced-up the van, and I couldn't wait to try onr. I discovered it's a sweet, starchy fruit, untart, with a hint of a red wine taste. As a former colleague of mine would have said, "mighty fne, mighty fine." You'll fine the stand about a mile south of Leslie on US 65. Chain of (Fancy) Foods, Mexicanesque-Style. I know it's a chain. I know, I am not much on chain food. Really, I'm not. I'd much rather experience local eateries and support local restauranteurs. 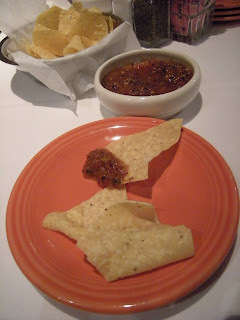 But I can't help but liking Cantina Laredo. Even with the prices. Our location here is pretty new. It opened in Midtown Mall last fall and, well, I pretty much ignored it. In fact, I was pretty determined not to go because of a review from a friend who said it was pricey to the extreme. But on a Wednesday afternoon in March my traveling companion and I found ourselves with a limited time to grab a bite and right in the area. And rather than try the old standby of Pei Wei again (which I like, don't get me wrong, but you can have too much of it) we decided to pop in to Cantina Laredo. And first thing that struck me was the fact that this just doesn't look like a Mexican restaurant. More American Lodge meets IKEA. Which isn't bad, but it's the sort of decor that 30 years from now will be considered the "decor of the oughts." Still, it's all right. We were shown to a cozy corner table and presented with menus of utter urban delights -- the sort of menu that would make one exclaim with delight and hope over and over again, things like Mexico City Chile Relleno (Picadillo filling with ground beef, pork, almonds, and raisins topped with ranchera sauce for 13.29) and Camarones Escondidos (Grilled chicken breast stuffed with shrimp, topped with sauteed spinach and chipotle-wine sauce for 18.99). Many of the items sounded way too incredible to be true. and pepper and a hint of something reminiscent of garam masala, served hot. He also suggested the "house special" guacamole made fresh at the table. I passed, since my traveling companion loathes guacamole... found out later on it would have cost us $9.49. We placed our orders and made pleasant conversation -- and were startled when our entrees arrived at what felt like a very rushed speed. 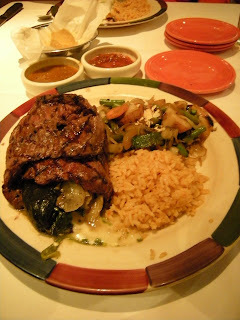 The plates were hot -- in that "yeah, you're at a Mexican restaurant" sort of way, but hotter -- and the servings large. And very, very pretty. My companion had gone for the Enchilades de Camarones ($16.99), enchiladas packed with shrimp, Monteray Jack, and peppers on a bed of spinach and veggies topped with a sour cream poblano sauce. I have to say, I wasn't really thrilled with the semi-cooked red onion in the dish -- but that's the only thing I can say about it. It was very, very rich and served with this perfect soft Spanish rice to go with it. My companion told me the cheese made everything just feel "melty soft" in his mouth. it was still lovely nonetheless. It too came with Spanish rice and with a melange of lovely roasted veggies -- green beans, zucchini, mushrooms, carrots, skin-on red potatoes -- lovely and not soaked with butter or any strange substance, just sprinkled with almonds. I quite enjoyed it but had to take some home with me. Of course, what is dinner without dessert? We decided to give the crepes a test drive. The piping hot apple filled crepes came out draped in caramel and flecked with almond slivers, with two round lumps of vanilla ice cream on the side. For $5.99, it was pretty darn good. But of course, there is the check. Before the tip, it still came out to nearly $55 -- a bit much for two folks on a budget. 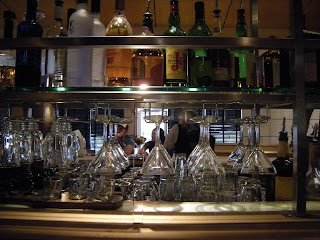 And that's without touching the margaritas -- which were inviting and tempting. So, the verdict? Decent and good for a restaurant, but yes indeed a bit pricier than just about every other Mexican restaurant in Little Rock. And that might kill it here. But if you have a couple extra bucks and want to go for something extravagant, knock yourself out. 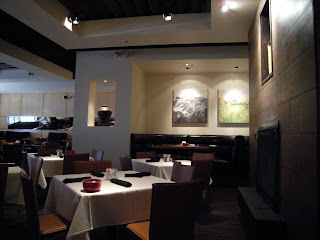 You'll find Cantina Laredo at Midtowne (the shopping center at the northeast corner of Markham and University). They have a website or you can call (501) 280-0407.